AI pioneer: ‘The dangers of abuse are very real’ – Yoshua Bengio, winner of the prestigious Turing award for his work on deep learning, is establishing international guidelines for the ethical use of AI. Exclusive: Google cancels AI ethics board in response to outcry – The controversial panel lasted just a little over a week. Movie Theaters Don’t Like Netflix. Netflix’s Solution: Buy Its Own Movie Theater Chain. Battle of the Beers—Can Anheuser’s Bud Light Ads Be Literally True but Legally False? Amazon Workers Are Listening to What You Tell Alexa: A global team reviews audio clips in an effort to help the voice-activated assistant respond to commands. Are we living in a computer simulation? I don’t know. Probably. : Why this computer scientist thinks reality might be a video game. Battlefield V: Firestorm Review – A solid battle royale that doesn’t pack quite enough punch to get to the final circle. Sonic The Hedgehog Footage Reveals Plot Details, Setting And Jim Carrey’s Robotnik: The adaptation of the Sega game is (largely) set in our world. Facebook asked some users for their email passwords, because why not: And two third-party developers left the data from millions of Facebook users exposed in S3 bucket. What If Google And Facebook Admitted That All This Ad Targeting Really Doesn’t Work That Well? Mercedes-Benz sued four artists whose murals appeared in its Instagram posts. Wall Street Thinks The Cable TV Sector Could Easily ‘Unravel.’ That’s Probably A Good Thing. Facial recognition can drive business goals, but where do we draw the line? The case for a smaller, more portable Nintendo Switch | Opinion – Portables were said to be dead — so why would Nintendo consider releasing a smaller Switch? After spending time reading articles on news criticality and truthfulness, I came across an article written by Nonny de la Peña on Immersive Journalism. So what is Immersive Journalism? Immersive Journalism in this context is the use of digitized tools, such as Virtual Reality (VR) to mediate news content and information. To further elaborate on an example that uses VR, an individual is given a headset to wear and experiences a virtual event that has been generated through a computer mimicking a real-life event but using digitality to represent the information of an actual event that has occurred, such as a person having a seizure. You are able to witness the person having the seizure but only in the virtual realm. This has evoked a lot of reactions to how one experiences an event, meaning that the medium of information becomes a foundational pillar to the experience itself. As Marshall McLuhan would say, “the medium is the message”. My question is the following, through using Virtual Reality, are we able to reach a new level of compassion when consuming news and information? will immersive journalism become the better alternative medium of news circulation? Yesterday, many articles were published online about Grindr, the most popular online dating application in the world for queer and gay men, being forced to sell due to US security concerns. The app Grindr was first developed and based in the United States in 2009. It became widely successful all around the world. The Chinese conglomerate, Kunlun Tech bought out 60% of the stakes, and outright purchased the app in 2018. In 2017, there had been around 27 million people worldwide using the application. Although it is unclear how many people out of the 27 million are actually US citizens, the Committee on Foreign Investment in the United States (CFIUS) has pressured or even forced Kunlun Tech to sell the application back to a US owned company, or even one of Grindr’s competitors. The application contains exchange of messages between users, their locations, and even personal information such as age, height, weight, and HIV status. The US is worried that Kunlun Tech could use this data in a negative way towards the US, therefore forcing them to sell. I think it is interesting how this issue was not first raised when the application was being sold, since the CFIUS has previously blocked other US popular applications being sold to Chinese companies, for example MoneyGram and AppLovin. Was Grindr not previously seen as a threat, leading to a successful purchase by Kunlun Tech? I’m also curious about what specifics the US security is worried about with the Chinese having access to this information. One of the most interesting points is that China not only purchased this application to gain access to data on Chinese Grindr users, but users all over the world. I wonder what they plan to do with data of foreigners, considering China is usually only interested in having power and control over their own people. I read a recent article talking about why people are giving up on online dating. It is interesting to see the psychological effect these applications have on people, and why we behave differently online versus in person. Three people were interviewed about why they decided to delete their dating apps. A main reason was because people become desensitized, and the dynamic/chemistry they create do not translate into real life. It seems like because people are talking through the lens of dating social media, they seem to forget that they’re talking real life people, and are more likely to be rude, uncompassionate, and send unsolicited content. A gay man who was interviewed said on the application “Grindr”, there are countless “catfish” profiles. It’s interesting to see that “catfishing” occurs more often on queer/gay online dating apps than heterosexual ones. However, it’s surprising to hear from a cyberpsychology researcher that despite so many negative responses to online dating, it will continue to be popular and stand the test of time. 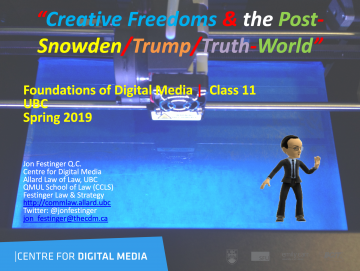 After reading New Zealand Censors Declare Christchurch Shooting Footage Illegal; Start Rounding Up Violators by Tim Cushing, I wanted to tie it to my previous journal on news distribution, legality, and ignorance. In my previous entry I focused on exploring the aspect of exercising critical faculties when reading news, following the recent mass shooting that occurred in New Zealand, I want to touch on the notion of exercising such criticality when distributing and re-sharing footage of violence and murder. We have arrived at a stage in digital media where the exposure to such violence has been somehow normalized, individuals are immunized from questioning the ethicality of sharing the tragedies of others, circulating the suffering and deaths of others without questioning the meaning of such act. This makes me wonder about how the digital media age has become a tool or a vessel of desensitizing grief. Individuals no longer feel the need to respect notions of privacy when it comes to the suffering of others that clicking the share button has become a simple swift movement on the fingers. New Virus Steals Your Files Until PewDiePie Gets 100M Subscribers: Another ransomware variant encrypts your files unless you subscribe to PewDiePie – but even if you do, it deletes them anyway. PewDiePie fans keep making junk ransomware: Please, YouTube! Just hide PewDiePie and T-Series’ followers count and put this competition to bed. YouTube Disabled Comments On Thousands Of Creators’ Channels To Prevent Child Predation. Tech Startup Respondology Thinks It Has A Solution. Law School Exam Part 5: Am I An Influencer? Disruptive Developments @20EssexStreet: What is the difference between a cryptocurrency trading platform and a kitchen blender? Internet Platform Governance, Part 1: What’s the Problem? What do Bruce Springsteen and Venus and Serena Williams all have in common? California and European Privacy FAQs: Does the GDPR require that a company obtain consent from a website user before placing cookies on its browser? The New Zealand Massacre Was Made to Go Viral: The attack marks a grim new age of social media-fueled terrorism. Americans Built Tech for China’s Sinister “Re-Education Camps”: MIT and Yale – and possibly Microsoft – are helping build China’s surveillance state. Vladimir Putin signs sweeping Internet-censorship bills: Publishing “unreliable socially significant information” can lead to big fines. The EU fines Google $1.69 billion for bundling search and advertising: Showing Google Ads above Custom Search results lands the company in hot water. Europe’s silver bullet in global AI battle: Ethics – EU experts hope ‘trust’ will prove to be the bloc’s competitive edge. There’s a Power Struggle Inside Google to Control Superhuman AI: If DeepMind builds a superhuman AI, who will control it? A Quarter of Europeans Trust AI More Than Politicians: They’d rather ditch human politicians and put robots in charge, according to new research. Instagram just took advantage of Amazon’s biggest weakness: Amazon’s failure in “discovery shopping” is Instagram’s opportunity, as its users can now shop inside the app. D-Wave 2000Q hands-on: Steep learning curve for quantum computing: Reconceptualizing a problem is the hard part, but the end is rewarding. NBA commissioner ‘surprised’ by changes after AT&T, Time Warner merger: “They are going to have to retool their packages so they are able to connect directly with that younger fan base,” said the head of the NBA. Why, Exactly, Do We Still Trust Telecom Megamerger ‘Synergy’ Promises? Hands on with Google Stadia: It works, but is that enough? : Playing Assassin’s Creed on a Chromebook is neat but only part of the story. Google Is Better Positioned For Cloud Streaming Than Anyone, But Don’t Expect The World Just Yet: Google isn’t afraid to shut down projects when they don’t work. For a description of the badges, go here.